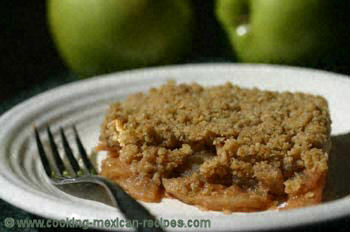 What comes to mind when you hear apple crisp recipe? Does it remind you of grandma or mom cooking dessert in the kitchen creating an incredible aroma of apples and cinnamon? I love ice cream so I immediately think of warm apples and cinnamon with a buttery sweet topping covered in vanilla ice cream. Makes my mouth water. My apple crisp recipe is an easy dessert to put together and a great alternative to apple pie which takes a little more time and preparation to make. Don’t get me wrong, apple pie is a fabulous dessert. I do make it on special occasions but apple crisp is so easy, you can put one on the table any old time. I thought you would never ask. I do have a definite opinion on that. I love to use Newton Pippin apples. They have this beautiful combination of sweetness verses tartness that I absolutely love. Sometimes I have a hard time finding the Pippins so when I have to substitute, I use Granny Smith. Mix the sugar, cornstarch, and cinnamon in a bowl, set aside. Peel, core and slice the apples and place them in a large bowl. I’ve started using an apple peeler corer machine which really speeds up the time it takes to make apple crisp or pie and it’s fun to use. Sprinkle the sugar mixture over the apples and stir well to coat the apples. Pour the apples into a 9 x 13 oven-proof dish. In another large bowl, mix the brown sugar, white flour and oatmeal flour. You can grind the oatmeal in a blender to make it into a flour or buy oatmeal flour. Add the butter and cut it in with a pastry blender until the butter is mixed in and crumbly, about the size of peas. Bake in a 350 degree F oven for approximately 30 minutes. This dessert is fantastic served warm, topped with vanilla ice cream a la mode. Want To Try An Apple Pie Instead? I’ve got a wonderful apple pie recipe here with lots of pictures.